Justinmind Pro versus Enterprise: which is right for you & your prototyping needs? Whether you’re a freelance designer embarking on a web or mobile app design project, or a global enterprise looking for a powerful, advanced prototyping tool, Justinmind has got you covered. Our software will enable you to rapidly prototype interactive wireframes and mockups that look and feel like the real deal. But which version of Justinmind is best for your individual project? Any design team investing in a prototyping tool wants to know that their needs will be met. A UX Designer looking to do quick and dirty wireframing will have very different needs from an international software provider overhauling their enterprise systems. 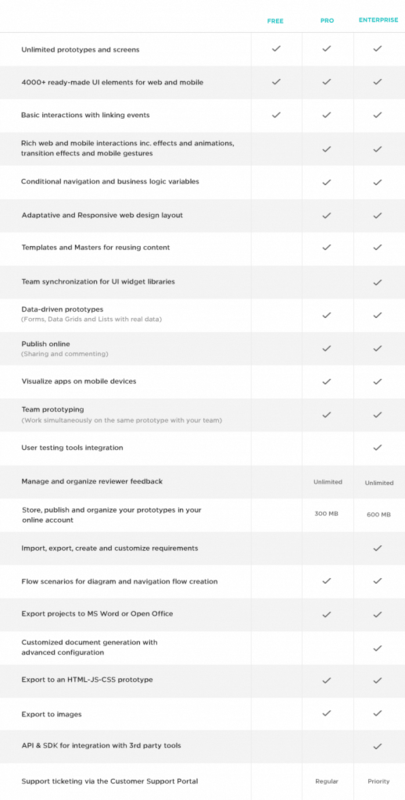 When it comes to prototyping tools, one size definitely doesn’t fit all needs. If you’re not sure whether you will be best served by Justinmind’s Pro or Enterprise editions, fear not – here we explain their respective features and the potential benefits for teams building digital products. Let’s get started on the Pro edition of Justinmind, an advanced web and app prototyping platform for individuals, teams and smaller organizations. With Justinmind Pro you can create web and mobile prototypes full of rich interactions built around user events; back these up with Pro’s huge range of transition effects. And for mobile app prototypes Justinmind Pro allows you to play around with gestures, the user actions – tapping with a finger, swiping on one section of your screen, etc – that trigger an action. The advanced interactions, transitions and gestures of Justinmind Pro mean your prototypes can be as creative as your imagination. Justinmind Pro is all set up to create hi-fi prototypes that react intelligently to user actions. By adding conditional logic to events you can design interfaces with numerous navigation paths you can create prototypes that provide the full experience. For faster prototyping, use Pro’s pre-loaded UI widget libraries – you’ll be able to build interactive user interfaces for web and mobile apps in a matter of minutes. But if you need your design to align with product branding and customization then you can import your own UI widget libraries, or create new UI elements from scratch. All imported widgets are listed in My Libraries tab, for rapid re-use and recycling across projects and prototypes. In Justinmind Pro you’ll find a prototyping tool that lets you create data-driven prototypes with real data that can be customized, filtered and paginated. Build data lists and data masters, populate them with real data and use them across web and mobile prototypes. Data visualization done simply. Justinmind Pro is powered by Cloud computing. That means that the whole design team can work simultaneously on web and app prototypes no matter where they are in the world. Pro’s Teamwork features allow you upload prototypes to Justinmind Online, where you can share and manage prototypes. You and your team can make changes in real-time within the same wireframe or prototype, get meaningful feedback about their creation, and to share their app or web prototypes with the developers. Sharing and collaboration drive Justinmind. Pro Features make it easier and faster for designers to create, iterate and succeed as a team. Sometimes getting feedback from stakeholders can be the best way to iterate on an idea. Justinmind Pro allows you to publish web or app prototypes to your Online account; from there you can create a sharing URL and share your prototypes with anyone you chose. Wireframes and prototypes can be viewed in any device or browser using the sharing URL. Being able to see the simulation on the actual device will leave little room for mistakes in the development phase. Reviewers can comment on prototypes, but as project owner you will have complete control over the people who can access and review your work. It’s easy to manage user permissions and access to your prototypes. And you can even publish prototypes on remote user testing tools. Start usability testing earlier on in the design process and ensure great user experiences further down the road. With Justinmind Pro edition, it’s possible to export web and app wireframes to images, documentation and interactive HTML. When you export to HTML you’ll be able to share your project with as many users as you want; they’re free to execute and test the HTML prototype as much as they want. You can also export Justinmind Pro wireframes as static images to include in presentation documentation, or into specification document that can easily be integrated into wider documentation processes. The user experience revolution has arrived in the enterprise. Software used by large enterprises can no longer afford to be clunky and unusable; employees expect the same level of usability from their ERP applications as they do from Snapchat. That’s where Justinmind Enterprise comes in. Our Enterprise edition is aimed at teams in large organizations: requirements management, security and enterprise tool integration come as standard. By the way, you can even buy the enterprise version directly online. Find out what Justinmind Enterprise can do for your global business. Remember those customized UI libraries in Justinmind Pro? In our Enterprise edition these UI elements can be shared to team members and synchronized – a change made to the master element will be implemented across users and prototypes. Everyone works on the latest version at all times. Eliminate the risk of misunderstanding and product failure through integrated requirements management. Our Enterprise edition comes equipped with a Requirements tab within the tool interface, from where you can define, manage and update requirements with your business team. Requirements can be imported or exported fast from .csv files, then customized within the tool. By attaching them to UI components or interactions within a prototype interface you’ll be able to easily track the progress of product development. There’s also a version history for requirements to facilitate status tracking. Already use requirements management tools? Justinmind Enterprise is built with easy tool integration in mind. Requirements definition and management just got a lot simpler. Justinmind Enterprise’s integrations go beyond requirements management tools. We’re also fully integrated with Atlassian JIRA and Microsoft TFS, or Team Foundation Server. Use JIRA integration to to easily share tasks between the two softwares. Changes are synchronized automatically , and it’s even possible to simulate product requirements between JIRA and Justinmind. TFS users can access the code management platform directly from Justinmind’s Enterprise interface. Software configuration, scrum management and testing/release workflows are right where you need them. What’ more, thanks to Justinmind’s Software Development Kit (SDK) you’re integrated with all ALM tools: any plug-ins developed with the Justinmind SDK are fully owned by you, ensuring security in the enterprise app design process. Justinmind’s updated online account makes it easier to navigate through your account, and manage your users, subscriptions, licenses and billing info. When sharing prototypes with our Pro edition you’re working in the Cloud; but with Enterprise everything is done on your own servers, to add that extra layer of business security. Only authorized users will have access to your firewall protected prototypes. On-premise storage ensures security. We’re fully SAML authenticated too, so don’t sweat it on security. If your enterprise team has further security needs, Justinmind’s platform can be configured to meet them. Just get in touch. Thanks to you Expert Partners, Justinmind Enterprise clients have access to the complete gamut of training, mentoring and consulting resources. You’ll also have access to our Justinmind Enterprise Support team and materials, for personalized and priority support. Justinmind Enterprise or Pro – which is right for you? With Justinmind’s Pro edition you can make web and mobile app prototypes that look, feel and behave like fully programmed apps, before touching a line of code. That’s enough for most individuals and smaller product design teams. But for teams that need to go the extra mile, Enterprise is a comprehensive prototyping platform that ensures security, facilitates requirements management and complete control over UI design. For teams working at the top of their software development game, Enterprise joins the dots.